Summary (from Goodreads): Be careful what you wish for ...Andi is short. And she has lots of wishes. She wishes she could play on the school basketball team, she wishes for her own bedroom, but most of all she wishes that her long lost half brother, Bernardo, could come and live in London, where he belongs. Then Andi's biggest wish comes true and she's minutes away from becoming someone's little sister. As she waits anxiously for Bernardo to arrive from the Philippines, she hopes he'll turn out to be tall and just as mad as she is about basketball. When he finally arrives, he's tall all right. But he's not just tall ...he's a giant. What I liked: To be honest, I knew I would adore this story before I even began. 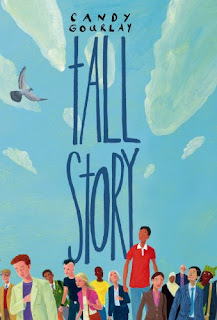 Everything about it screamed ‘heart-warming’ at me, which is exactly how I would describe Tall Story. It’s one of those books that is so sweet it makes me want to frolic through a field with a puppy or something, in a good way. When I finished the book I sat back for a few minutes and savoured what I had read, feeling all warm and fuzzy and that definitely cannot be a bad thing. I always enjoy a split narrative and this one was executed brilliantly. Gourlay has Andi and Bernardo’s voices spot on and I wasn’t confused for a second as to whose point of view we were hearing. Bernardo is a gentle giant and his character is so lovely, I just wanted to hug him, especially after he first moved across to London and had a few mishaps adjusting to English life – the ‘running the bath’ disaster was my favourite. There are a whole host of delightful characters in this novel, including Bernardo’s neighbours from his village in the Philippines (Jabby and Old Tibo are particular highlights) and Andi and Bernardo’s mum is another great one to look out for. What I didn’t like: Well, thanks very much Ms. Gourlay for making me weep throughout your novel! I know, I know, I’m prone to crying at every available opportunity but I did shed a little tear more than once during Tall Story – especially when we discovered Old Tibo’s back story. Absolutely heartbreaking! Although, this isn’t a bad thing for the book itself, I’m just trying to toughen up and it doesn’t help when books like this come along and reduce me to a blubbering mess! Final thoughts: A heart-warming story that shows that size definitely isn’t everything! Thanks for the lovely review Carly, and I'm sorry if it made you cry! I'm really looking forward to digging into my copy of this now! If it made you cry, it'll probably make me cry too. Completely love Tall Story, it's a terrific story, beautifully written. For a debut novel it's extremely accomplished - Candy Gourlay is one to watch.